Black Friday - Cyber Monday... Ahhhhh! Christmas Shopping - FOR ME! It is slightly after midnight on Thanksgiving, tomorrow, I will go Christmas shopping FOR ME! For the past two days, I've been in the Sun Times (Sandra Guy's column) about my holiday shopping "tips and deals". I thought I'd share a few of these Black Friday and Cyber Monday tips and deals with you here on my blog. See below for some of the items I mentioned in those articles. Also, if you like PINK Christmas decorations (pink Christmas trees, Hello Kitty ornaments, etc, check out - Hot Pink Christmas! ONE MORE ADDITION! Great holiday gift for a new bride or any woman who loves to cook! 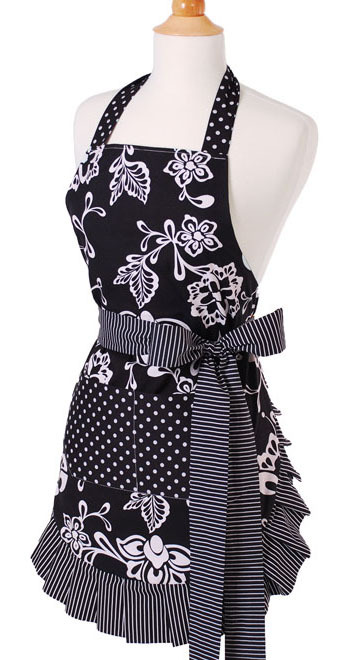 Extended to today, get 40% off everything, including this Sassy Black apron below, from Flirty Aprons. They are also offering FREE SHIPPING for their extended Cyber Monday promotion on all purchases (cannot be used with other promos or discounts). Addition: Please check out my friend Jason Rubacky's new hip hop lifestyle site and the shop - www.poundgetsome.com #GETSOME! They are offering 40% off on Cyber Monday. I love Garmin products, particularly the running watches like the Garmin Forerunner: GPS-enabled sports watches - they are pricey but they calculate your miles and you can upload them to your computer, track your speed, calories, etc. My favorite Christmas Gags gifts can be found at Stupid.com - things like bacon ornaments and poop related gifts are all here! This site is a gold mine for people who love ridiculous crap, in fact, I showcased Stupid.com once before on a previous blog post. Free People has FREE shipping for Black Friday and Cyber Monday - certainly check out their Holiday "Limited Edition" dresses. 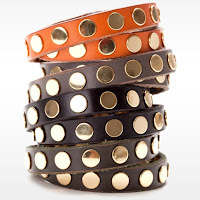 One can find many personalized gift items, ideas and holiday inspiration from Beau-coup.com. This is a great site for holiday party favors and bulk items for just about any type of party or occasion imaginable. 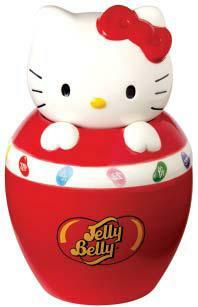 I love this site... Kidrobot.com so many neat items for kids and adults. 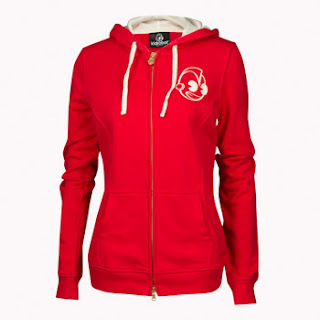 If for no other reason, it is worth taking a browse on their site, but they do have a Black Friday sale currently going on where you can find hoodies, graphic tees, hats, accessories and more. Lightinthebox.com is a crazy site (similar to Overstock.com) where you can find just about anything you're looking for - it is like being in some crazy mall in Asia - wedding dresses to cell phone cases, they're all here. 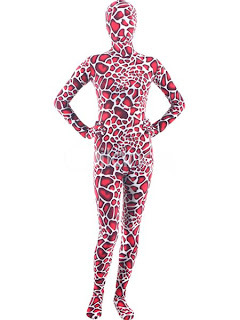 Another good site (similar to Lightinabox) is Milanoo.com - they have more crazy Asian stuff - everything from Wedding dresses to Cosplay costumes to crazy (and super creepy) jumpsuits like the one below. They have a Black Friday Sale where you can - Save 20% off with -- the Code:BF20 - pick up this insane catsuit while you're at it. Last but not least... my favorite (and where I will be sipping champagne at 10a.m. tomorrow! Agent Provocateur. Luxurious lingerie for women (located on Oak Street in Chicago) Or online at www.AgentProvocateur.com does not have a sale, but they will have champagne for their guests all day tomorrow. I will need some after my miserable Thanksgiving. I will also look forward to shopping for ME after sipping my champagne. ** Disclosure -- some of these links are "affiliate" ads - which means I may / may not receive a commission if you purchase something once you've clicked on my link. 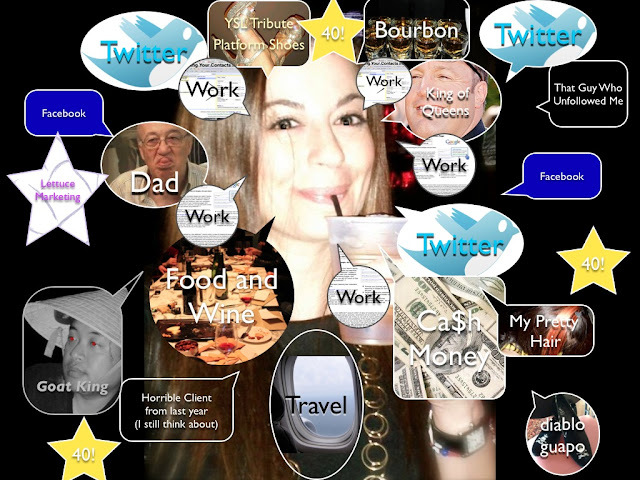 If you need to know more about affiliate or performance marketing, click on my "about me". What Goes On Inside Leyla A's Brain? Earlier tonight, I started thinking... What if I created a tag cloud of my brain! Immediately, I started to think of phrases that would fit. And then when I sat down to make this image (which took me WAY longer than I had anticipated), things changed a bit. Goat King - He has become an omnipresent in my life, I don't think I communicate with anyone as much as I do with Goat King. YSL Tribute Shoe - I love shoes... especially big, platform-y ones. Lettuce Marketing - my company is called Lotus Marketing but my dad mocks it and calls it "Lettuce" - sometimes he leaves me voice mails trying to order a salad. Diablo Guapo - A long-time friend, his representation on the tag cloud is probably inaccurate in relation to the actual brain space he occupies, but because he's always around, sometimes one takes for granted and neglects to make mention. This is why he doesn't appear in the tag cloud of my brain larger or more frequently. Food & Wine - I like to eat (and drink)! That Guy Who Unfollowed Me - those "guys" are always out there... and, yes, I have a hard time letting go sometimes. Ca$h Money - I like cash money, I like to get paid! There are other things that didn't make the tag cloud of my brain - like love, happiness, my mom, my brothers, friends, shopping, fashion, clothes, aesthetics, pop culture, etc. They exist, but one only has so much free time, readily available images and concentration at their disposal. Perhaps I will give this another go in the near future. I Think You're Sitting in "The Parents Section"
On 11/9/11some friends and I headed to see The Airborne Toxic Event at the Riviera. I really like this band because they remind me of the kind of music I liked when I was young. They also write lyrics that leave me reminiscing of my angst riddled teen years where I sat around and obsessed over my high school boyfriend and dreamed of fairytale futures. I was a little concerned about attending an all ages show at The Riviera Theater, but figured, my friends are all my age and older, I should be fine. We did not have to fight through any crowds, as we had reserved seats in the in the balcony. Once I was seated, I looked around and felt a sense of comfort come over me - everyone in the audience (around me) was at least my age, some were significantly older. 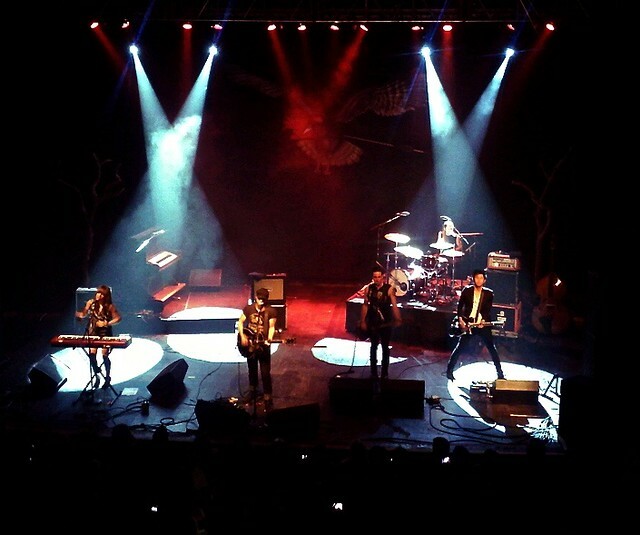 Was this partly due to the fact that The Airborne Toxic Event was a WXRT show? I did not know, I was just relieved to be in the company of my peers. As the band went on to play their songs from their two albums, my friends and I snickered with each other as the band made silly announcements like, "This is an old song..." We jokingly asked each other, "Really? Old? As in 2007?" At one point I tweeted, "I have tattoos older than these kids." There were also moments throughout the show where I felt like a proud, older sister as I watched the kids on stage jump around like pretend rockstars trying to emulate their musical heros of yesteryear. Because I had experienced the place in time they were trying to pattern themselves after, I could not help but feel that I was in some way responsible for their antics. About half-way though the show, I had to go to the bathroom, I waited for a slow song and headed out. As I headed down the stairs, flashbacks of my former life came at me from all directions. As I walked on to the main floor entry way, I saw 15-16 year old boys and girls flirting with each other by the stairwell. I thought about all the times my mom dropped me and my friends off at "The Riv" and recalled flirting with boys in that very spot. As I headed down to the lower level (where the bathrooms are located), the memory of the all-ages, house music, dance parties I attended in high school came back. I also saw moms and daughters entering the bathrooms together - very much like my mom used to do with me when I was a too young to go alone with friends. I hated it that she wouldn't even let me go to the bathroom alone, but in retrospect, I am happy that she took the time to go with me. I returned to my seat just in time for the "hits", the band played three of their "hits" in a row and the crowd went wild. The 30+ year olds around me were now standing up, dancing and singing along. 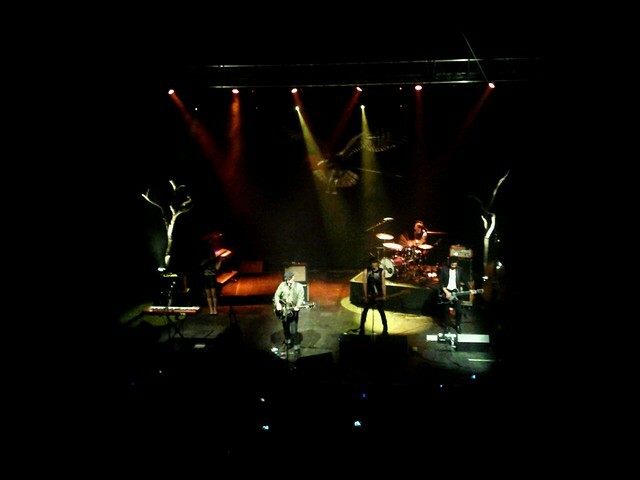 Soon after, the band left the stage, we stayed put and waited for the encore. The crowd was excited when they returned - more jumping and dancing. After the final song, we headed down the stairs to the exit, my friends went to the bathroom and I waited by the front doors... watching the crowd. I noticed the older people coming down from the section I was sitting in, the balcony. I also noticed the kids coming out from the main floor area, the younger kids who had been standing closer to the stage. I then noticed the older people from my section coupling up with the younger people from the main floor, and it became evident.... The older people from my section were meeting up with their kids who were watching from the main floor. I was seated in the Parents Section! I have not had any time to write anything in a while because I've been busy with work. Plus, I haven't done anything worthy of an entire blog post. I mean, I don't think you want to read about me sitting for 16 hours working and listening to Spotify, do you? But I have come across a few fun things to share with you. 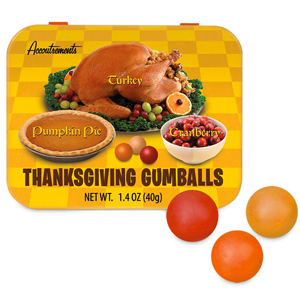 With the holidays coming up, I found this neato item from Stupid.com (a site that is quickly becoming my favorite place for gag gifts) - Thanksgiving Gumballs in case you want that Thanksgiving taste all year round. Not into Thanksgiving? That's Ok, because they also have Christmas Candy too. My (affiliate) site hotpinkchristmas.com has me searching for all sorts of PINK Christmas items - like ornaments, wreaths, trees, etc. 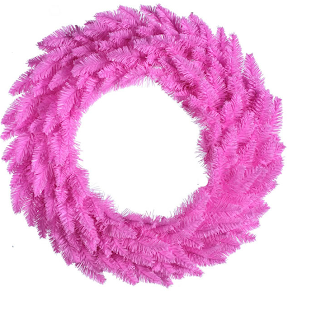 I've found lots of cool stuff like this hot pink christmas wreath! Lot 26 Studio - I actually found these guys at the shareasale.com Think Tank earlier this year and I love their stuff. 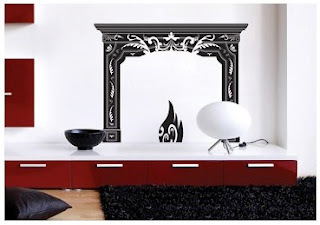 You can get something as simple as baby blue dots for your walls to sports art canvases (which you know I don't care about) to something as detailed as this decorative fireplace decal. My Halloween sites always take me to the craziest sites. Here are some of my favorites. Sorry, no pictures here because a) I don't have the time and b) some of these things are too ridiculous to post. FlashingBlinkyLights.com -- whatever you can image, they have it for sale, and it is lighted and blinking. Everything from flashing earrings, flashing team mascots, wedding lights, lighted swords, glow sticks - seriously, things you would never even consider lighting up. Crazy contact lenses - for my Halloween site I found AC Lens a contact lens site that has all sorts of contact lenses, regular ones for normal people, and then insane ones. So, if you're looking for "blind" contact lenses (they white our your pupil so you look blind) or "black out" contact lenses (just the opposite, they make your pupil huge and black) you've found the right place. P.S. here is my disclosure, most of these links are affiliate links (if you don't know what that is but you do want to know, click here). But I will further disclose that I really do like these things. Longest Post About Istanbul EVER!